Baia Mare (Romanian pronunciation: [ˈbaja ˈmare] ( listen); Hungarian: Nagybánya; German: Frauenbach; Ukrainian: Бая-Маре; Latin: Rivulus Dominarum; Yiddish: באניע‎, Banya) is a municipality along the Săsar River, in northwestern Romania; it is the capital of Maramureș County. The city is situated about 600 kilometres (373 miles) from Bucharest, 70 km (43 mi) from the border with Hungary, and 50 km (31 mi) from the border with Ukraine. Located south of Igniș and Gutâi Mountains, Baia Mare had a population of 140,738 at the 2011 census, and a metropolitan area home to 230,932 residents. The city administers four villages: Blidari (Kőbánya), Firiza (Felsőfernezely), Valea Borcutului (Borpatak) and Valea Neagră (Feketepatak). Baia Mare has been named the Romanian Youth Capital from 2 May 2018 to 1 May 2019. The city is situated in the Baia Mare valley and is encircled on all sides by hills and mountains, which makes the climate in the city milder than the rest of the surrounding area. Proof of this is that the outskirts of Baia Mare are the only areas where you can find chestnut trees that usually need Mediterranean climate to grow. This is the northernmost reach of the chestnut tree. However, abrupt temperature changes take place and, during the winters, the temperatures may occasionally drop below -20 degrees Celsius. The summers are mild, cooler than in the rest of the country. The precipitations in this area are quite high, due to the mountains in the north and east which do not allow the air masses to pass beyond the region's limits, the average rainfall being almost 1000 mm/year. 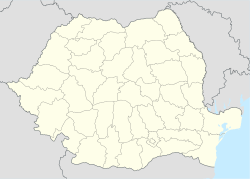 The city of Baia Mare is the most populous of northern Romanian cities (Satu Mare, Suceava, and Botoșani), with a population of approximately 149,735. It also has a high level of culture and education, being home to theatres, schools, museums and art galleries. Not far from the city there are a few very important natural reservations, among them Creasta Cocoșului, Cheile Tătărului, Lacul Albastru etc. Because of its privileged location in the Eastern Carpathian mountains it is considered one of the most picturesque cities in Romania. Before the Second World War, Baia Mare had a community of more than 1,000 Jews. In 1944, most of the Jews were deported by the Hungarian occupation authorities to Nazi concentration and extermination camps. Most of the few survivors emigrated from the area. As of 2011[update], 32 Jews lived in the city. Along with Rădăuți, Gura Humorului and others, Baia Mare had a Jewish shtetl, or settlement. The synagogue dates from 1885. The Baia Mare Municipal Council, elected in the 2016 local government elections. The road infrastructure within the city is changing to be able to better connect the city and absorb the traffic. An express road is to be built between Petea (at the border with Hungary) and Baia Mare, a project for which the feasibility study has just completed[when?]. The express road will connect the cities of Baia Mare and Satu Mare to the Hungarian motorway M3, and thus to the whole European motorway network. ^ "Primari alesi pe judeţe şi circumscripţii" (in Romanian). Romanian Central Electoral Bureau. Retrieved 13 July 2016. ^ "Bielsko-Biała - Partner Cities". 2008 Urzędu Miejskiego w Bielsku-Białej. Retrieved 10 December 2008. Wikivoyage has a travel guide for Baia Mare.